Yesterday we setup our first installation of BuddyPress, the WordPress MU specific plugin package that transforms any WPMU installation in to a social networking platform. BuddyPress is still in a pre-release state, and therefore the installation process has not been streamlined into a nice easy package. I decided to write this article to help anyone else who is trying to install BuddyPress for the first time. This article is very detailed so beginners and experts alike can setup BuddyPress! One thing to note – When you install WordPress MU, DO NOT edit/rename the wp-config-sample.php file. This is a common mistake made as that is what most people do to install WordPress. If you edit this file your WordPress MU site will display a blank page. WPMU will automatically rename/edit the wp-config-sample.php file during the setup process. The installation guide helps, but there are a few issues it fails to address. Scroll down to the bottom and click the link titled Zip Archive. This will download the most recent release of the BuddyPress framework. Extract all of the components from the ZIP file inside the trunk folder to a directory on your computer. Now comes the time to install the components to your WordPress MU installation. Upload all of the component directories and files (except for buddypress-theme) that you extracted during the previous step to the wp-content/mu-plugins folder. Your mu-plugins directory should look similar to the screenshot on the left. Open the buddypress-theme folder. The two folders inside are buddypress-member and buddypress-home. Navigate to wp-content/themes/ directory on your WordPress MU installation. Delete the home folder from your server and upload the buddypress-member and buddypress-home directory from your computer to the themes folder. Now log in to your WordPress MU admin dashboard. If you copied all of the plugin files and directories to the correct places you will now notice a few new admin sections under Site Admin called BuddyPress, Groups, and Profile Fields. The final step is to enable the BuddyPress Home Theme on your site. Navigate to Site Admin > Themes and activate the BuddyPress Home Theme. Now navigate to Design > Themes and click the BuddyPress Home Theme and activate it for your specific site. Now you can view the new theme via your main site URL. Congratulations! You have just setup a vanilla install of BuddyPress for WordPress MU! Error Message: The image you upload must have dimensions of 450 x 450 pixels or larger. This error means you have not uploaded the theme folders and files properly to the wp-content/themes directory. You need to extract two folders inside buddypress-theme from the trunk zip, buddypress-member and buddypress-home. Both of these folders need to be placed in your wp-content/themes directory for the profile theme to work. Make sure you delete the old home directory that WPMU created first. You need to enable registration on your WordPress MU site. Navigate to Site Admin > Options and Enable Registrations where it says Allow new registrations. I hope this article helps anyone wanting to install BuddyPress. If I missed anything or you run in to errors not covered please post a comment. This post will make a nice repository for helping others along the way and we’ll try to help as best we can. WebDevStudios.com is learning the ins and outs of BuddyPress so we can offer this service to our clients. If you are interested in launching a BuddyPress site, please contact us! Thanks for the writeup, it’s good read about your experiences getting up and running. I would strongly reccommend not using the tagged components at the moment, and sticking to the trunk version. The benefit of this is you will get the absolute latest version, as well as being able to download everything in one zip. The tagged components are quite out of date at the moment. You can get a copy of the latest trunk version in one zip package by visiting this page and hitting the “Zip Archive” link a the bottom. Thanks for the suggestion. I’ll update this post to use the trunk zip archive instead. Much easier! I’m going to update this article shortly to reflect this change. Actually i knew this change, have already done the changes that where required still itz showing the same error and also in admin area no themes are been displayed in buddypress theme area. Waiting for your reply. For some reason, the stylesheets don’t seem to be loading when I go into the Members area. I’ve tried it in different browsers. Its an awesome post. It really helped me installing buddypress. Registration has been disabled has been disabled how to activate? i found settings and nothing about enable registration !! Trying to install a buddypress/MU/bbpress full integration. I am getting consistent errors when I try and create groups. It tells me: There was an error saving group details. Please try again. It still appears that the login syncing is not working. Not sure what else to try. Same error here: “There was an error saving group details, please try again”. I am using the very latest BuddyPress build – trunk-r1704 downloaded today, latest WordPress-mu-2.8.4a and bbpress-1.0.2 forum. Anybody has an idea where to look for the solution? I have just installed Buddypress which is working fine but I can’t now access my wordpress administrator account. 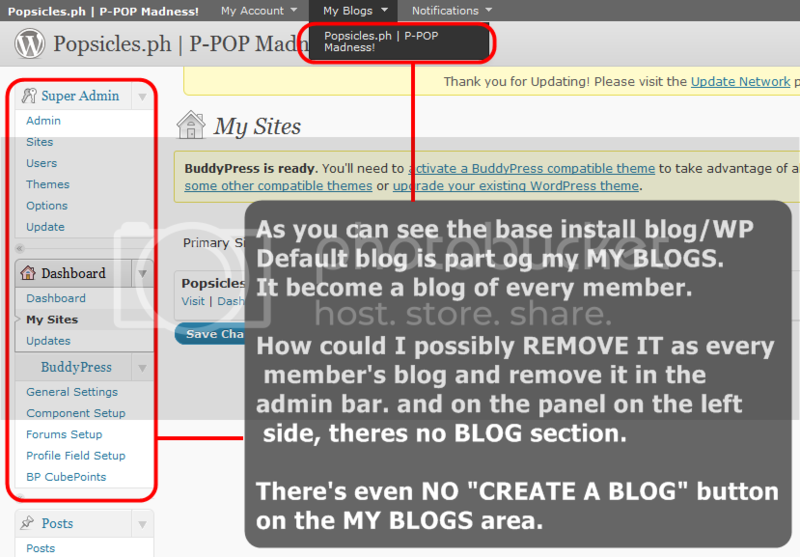 When I login to WP I just get logged into my buddypress site and the admin link does not allow me to do much. Anyone know how I can get back to my control panel? This post is now 3 years old!